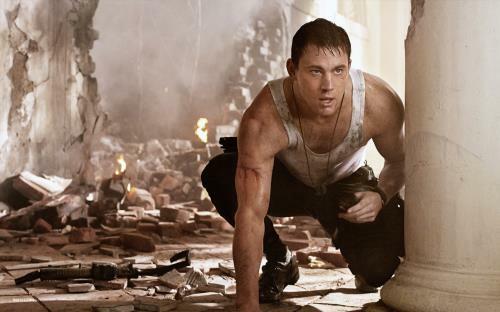 White House Down is the second movie showing the Capitol under siege for 2013. Like Olympus Has Fallen, White House Down tells the story of a man (Channing Tatum, Side Effects) who’s denied his dream job of protecting the President (Jamie Foxx, Django Unchained) then ends up being the one person who can save the country. Tatum’s John Cale is a Capitol Policeman, and when he takes his daughter on a tour of the White House, he ends up being in the right place at the wrong time. When a heavily armed paramilitary group takes over the complex, Cale’s the only one who can save the day. Directed by action movie guru Roland Emmerich (2012), White House Down also stars Maggie Gyllenhaal (Nanny McPhee Returns), Jason Clarke (The Great Gatsby), Richard Jenkins (Killing Them Softly) and James Woods (Straw Dogs). Also like Olympus Has Fallen, White House Down got mixed reviews from critics. Says Globe and Mail‘s Liam Lacey: “Formula action films don’t come much more formulaic than this.” Globe and Mail even likened White House Down to Die Hard at the Capitol, which is what many also thought of Olympus Has Fallen. White House Down grossed a tidy $72.8 million in theaters, less than the earlier Olympus Has Fallen ($98.9 million) but probably only because moviegoers perhaps rightly suspected they had seen the film already. and “Recreating the White House” about the detail that went into replicating the Capitol building.